183 Daily City Photo blogs are participating this month - will they show a metal object, as I have, or a heavy metal band, or something even more conceptual? Take a trip around the world and see! This metal wagon-wheel is in a back-yard I frequently drive past - a sort of informal sculpture garden! Yes, it is like sculpture - love the grass growing through it. Good choice. It looks like an abstraction of a Japanese fan! Nice to see it. I've never seen a metal wagon wheel before! I think it makes a great yard sculpture. The wheel surrounded by green nature is a wonderful contrast, Sharon. Great choice! Interesting piece of metal. I wonder what it's function is? Great photo! I like it...wish I knew what it was in it's working days. 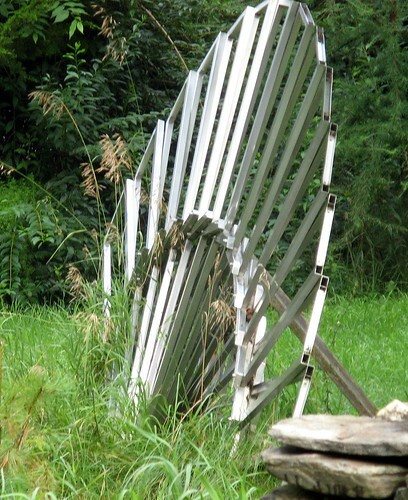 I like informal sculpture and this is a beauty you captured for the theme. Enjoy! it really does look like a sculpture. happy august theme day Jenny! Didn't even know they make metal wagon wheels. Interesting. I had no idesa what this was, so it was an intriguing image. A metal wheel of a wagon. That's a very nteresting and rare photo for the theme day. Great! I love how you manage the angle! Oh yeah, love it!